Court 1 was opened last week and I finished Court 2 over the weekend. All the windscreens have been put up. We do have some additional maintenance next to Court 1 where the asphalt apron joins the clay courts. The edge has been crumbling and needs repairing to reduce potential injury. We cut an edge with a saw and removed a concrete block that was sunk beneath the edge. We intend to pour a concrete patch between the new cut line and the court to reduce the potential for a twisted ankle or turned knee. Should take a few hours to do on Wednesday and will be in good shape by the next day. The old asphalt courts were removed a couple months ago and I had coordinated with a contractor as UMSL to assist us with getting some free fill dirt to fill in the area. Unfortunately, they pretty much used all the dirt and had none available for us to use. I'm currently attempting to locate a potential source for some free dirt. Member Mark Matteson from Clayco is trying to locate some dirt from their various projects around the area. We will need approximately 400 yards of dirt to fill this area so buying topsoil is out of the questions right now. In an effort to improve the look of the area and reduce the potential for tennis players and golfers walking through a muddy mess, we have seeded and strawed this area to get some turf cover started. This is only temporary until we can land some free clean fill, and I emphasize free! Video below is Skip cutting the edge. We also will be repairing the cart path along 17 as well which we cut with the saw in preparing to remove. After making the cut, Skip and the staff removing the concrete blocks. The area will be filled with about 6./10 of a yard of concrete. 4" wide x 120 feet long and an average depth of 5"
Venting is a term we use when we have very little disruption to the green turf surface but have a great effect on our green profile. Today we began venting our greens with our Verti-drain 7316 and 5/16" needle tine. 8 tines per holder with 48 total holes being placed into the surface about 5-6" deep. The greens were rolled behind the work and will be mowed on Wednesday. We still have greens 13-18 left to do. We will needle tine a couple more times this summer and will Hydroject as well which is a machine that sends a stream of water at very high pressure into the surface. This is schedules the Monday after Invitational and the 1st week of August. Probably another needle tine around the end of the August and then our season ending aeration at the end of October. Gas exchange, oxygen in and carbon dioxide out. Moisture relief and or ability for moisture to penetrate more quickly and thoroughly through the turf profile and reduce Localized Dry Spots. Improvement in root development. Air space encourages roots to grow toward the small openings provided. When I installed the first hive a couple of weeks ago, did not install the Queen properly in the box. I hoped the errors I made did not effect the hive. A few days later everything appeared to be okay with bees going in and out of the hive but by the following Monday there was no activity. A couple of things could have happened. My install of the Queen was not proper and she was injured or died or the Queen flew the coop and took the bees with her. Also, I was using old frames and the waxy foundation that hangs from the frames had fallen and were not properly hanging which probably forced the Queen to move out. The second box was installed with new frames which were much more secure and installed properly. It does not appear the bees moved to the second hive. I checked it late last week and things are going well. The bees are building comb but I could not see the Queen. I'm sure she is in there because the hive was orderly and a great deal of work was taking place. Bees were moving in and out of the hive frequently and for the most part they were ignoring my movements of the frames in and out of the box. I did notice a problem with black ants trying to form at the top of the box. Remedy for this was to place a couple of bottles of bee syrup in soda bottles with the some borax. The ants would crawl into the bottle, go for the syrup and get a snoot full of Borax which killed them. Natural and safe for the bees. Maybe next season I can recapture the hive that left if they do a swarm on property next spring. Hated the mishandling but have just had too much going on to work a mentor into the program. As things begin to slow later in the season will develop a relationship with an experienced keeper. Been communicating with both brothers who do bee work but not like being around in person. Bottle on the left with floating ants. Two bottles behind the protecting from ants marching! Since 2009, I've been making efforts to reduce Bermuda contamination in our fairways. Some have questioned this practice and wonder why we should we do anything to them, they look great. If I was wanting to make life pretty simple for myself, I would just have the guys mow grass day in and day out. Play golf with members and couple times a week or maybe take a loop around other clubs in the area. Heck, why do anything except keep it green and keep it mowed. Sorry to say I'd quit if I was not allowed to attempt to make improvements to the property in the many ways we have over the last 7 years. I find improvement stimulating and at the same time challenging. I realize killing turf and not being able to repair it all at once is difficult for some. I don't necessarily like to see bare spots but as I've mentioned before, short term pain for some long term gain. In the 1990's, the club made a decision to install zoysia at about $ 250,000. Bermuda contamination is probably at 25-30% and continues to increase. There are a number of reasons why we should make every effort to encourage zoysia. Zoysia is a superior playing surface and stays in better condition during dormancy which lengthens the golf season. Zoysia is more cold tolerant and not subject to winter kill like Bermuda which usually occurs every 5-10 years in St. Louis. 1991, 1995, 1999, 2005, 2013. How do you remember those dates? As a superintendent you remember the bad years. Zoysia allows the ball to sit up better than Bermuda. There are relatively lower cost combination of chemicals which does show positive results in Bermuda removal.. Specifically four fairways were chosen to begin our work because of their lack of Bermuda, Four, seven, off the tee on 8 and 13 were worked on over a couple of years in the beginning with good progress. We did take off in 2011 and 2012 because of green issues and severe heat/drought respectively in those two years. The Bermuda made gains back after no activity. In 2013 I did a few more spots and last fall I decided it was time to be pretty aggressive. We would never make any large scale gains if I did not get more aggressive. Along with about 10 acres spot sprayed last fall, I believe there were some Bermuda damaged from the cold we experienced in February which was actually colder than last February. The combination of our two sprays last fall brought on some pretty significant loss. The staff has laid about 600 yards(5,400 sq/ft) of sod in the previous 3 weeks which is about the total area of 4 green. With the rain last weekend and our inability to mow any grass at all on Monday, I made a decision to do no sodding this week. We were behind in our mowing and trimming the course and our staff worked diligently over the last 4 days to get the course cleaned up. In my inspection around the course today I only saw a couple of holes that trees were not trimmed around. We have sodded areas on #5, 7, 12 and 15 as well as the stump holes that were created in late April. If the weather cooperates next week, I would expect to do another 2-3 pallets next week and each week until the areas have grown back in or we have replaced them. We've been putting in about 40 man hours a week toward sod removal and replacement. I've been personally involved in marking areas. I know some of the areas are rather patchy that we are doing but the perimeter of many of the areas will fill back in. With the amount of Bermuda that we have if we did not allow them to fill back in we would have dirt for a long while until they grew back in or we had time to repair. I do plan on hitting some areas with large patches of zoysia next week to knock back the Bermuda that is coming up through these spots. If I do not reduce this competition, all will be lost. Over the last 10-14 days there has been great improvement in some areas but I know there are still areas with no turf. Warm and humid nights that we experienced last weekend as well as this weekend will continue to improve these areas. We have not fertilized as of yet and will not do so until the patch disease has calmed itself down in the fairways. Once that takes place which is usually sometime after Memorial Day, we will give the warm season turf a shot of fertilizer. The combination of that and warmer soil temperatures will move the turf further along. As I told everyone in our committee meeting Wednesday night, I expect 99.9% of the fairways to be in perfect condition by Invitational Time the last week of June or sooner. Sorry to say because of shade and drainage issues, I would always expect to have some slight wear issues in heavily shaded tree corridors. We intend to do some light aeration and slicing in June which should help to improve conditions and reduce stress.We will also perform some deep-tine aeration as well. This will be done in early to mid-June so as not to interfere with The Invitational. Feel free to stop me and talk about these efforts/ I painted most of the areas last week for the 2-man qualifier and ran out of time and used nearly 12 cans of paint. I don't like using 12 cans of paint, especially in marking fairways but we will see great progress in the next couple of weeks. Put the second Bee box together today. The video below illustrates how our Queen was packaged. (Not my video) The substance to the left is candy and the bees in the hive chew away the material to release the queen in a few days. Video of my placing the foundation material in a frame. This is where the bees attach the comb to the waxy foundation. After the installation of the second box. We have plenty of native beehives on our property. This evening I established our first man eastablished Honeybee hive at Glen Echo. We will have two colonies located between holes 11, 12, and 13 in the native area that we have established over the last few years. As you've seen recently, we've sprayed out the area and intend to sow some wild flowers and little blue stem in this area. Its kind of a long video but it shows you some of the steps I took to install the hive. The ending was not recorded because my camera tipped over, probably well and good anyway since my installation was not necessarily the smoothest. I'll make another video for the 2nd and hopefully will improve upon my work. More information will be forthcoming as I learn it as well. This project is new to my knowledge base and will take some time to understand what is taking place. Waiting on a train near River Des Peres and Hwy 55. Bee boxes ahead. A little sugar water for the bees. Much tastier than the sap when it started a few months ago. 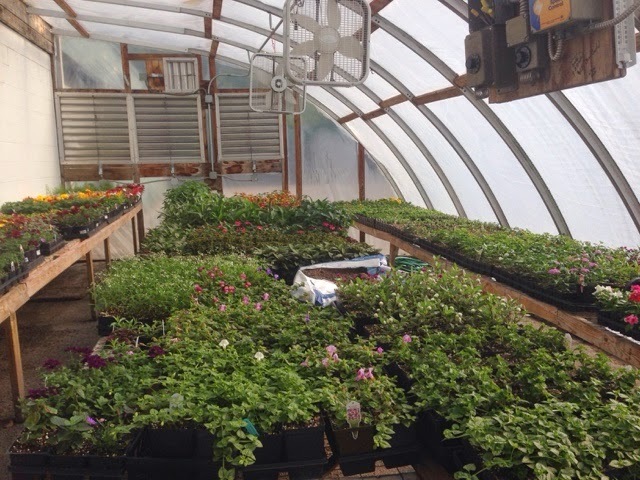 Thanks to our members who showed up and supported the plant sale on Saturday. Not a huge number of people but we still sold over $ 1,004 in plant material which was tremendous. Thanks again for your support of our program. Hope for the best day for all the Mothers out there on your special day. The Long Range Grass Tee was officially opened today with the first shots being made by about 1/2 of our 17 member donor group. The grass tee will be open weather permitting on Wednesdays and Friday through Sunday until sometime in June when the turf will be actively growing and can fully recover from divots. On Tuesdays and Thursdays, the mats will be used on the Long Range but the Short Range Grass will be open for your grass hitting pleasure. We still must install a couple of poles and the netting on the Long Range Tee over the next few weeks and time allows. We are very appreciative of our group of members who donated to this project. Over $ 22,000 was raised and spent on this project. Mr, Coe, Dr. and Mrs. Herrin, Mr Henderson, Mr Storey, Mr Abel, and Mr and Mrs Muller taking first swings. Mr Todorovich arrived after the first swing. Contributors but unable to attend included Lockhart, Caruso, Sommer, Dr Miller, Mr Anthony Bommarito, Carsten, Pranger, Lueken, Gabel, and May families.